Defeatist though this might sound, there is no cure for this common affliction that mars and, in severe cases, can even disfigure the face of a sufferer. Large nodules, especially near the eyes, can distort facial features and the forming of cysts can be tormenting in such sensitive areas. The consolation is that there are courses of action to follow that can curb the conditions that allow it to flourish. In order to manage the condition, a brief, simplified summary of how acne begins is helpful. Acne is inextricably linked to the body’s sebaceous (oil) glands; the natural sebum it produces lubricates and protects the skin, however, in problematic cases, excessive sebum (oil) affects how the skin cells mature and can predispose them to block follicular pores. Plugging of the hair follicle is what is commonly referred to as a whitehead or blackhead. This becomes a bump and can rupture, allowing access to bacteria and other irritants, causing inflammation. Depending on the extent of the inflammation, papules (pimples) or cysts will form. An increase in the production of sebum (termed seborrhea) and corneocytes, which are skin cells (termed hyperkeratosis, an inadequate shedding of dead cells), are the major factors that result in blemish-prone skin. Scars can be deep and narrow or manifest as a gradual dip or depression. A consultation with your dermatologist can considerably decrease/curtail the unfortunate manifestations of what is essentially this form of inflammation. To determine the best route to take, which will differ from individual to individual, it is important to ascertain what most commonly causes one’s own condition to flare up. That no single, conclusive, root cause has been identified, leads to additional disconsolation, but there is clarity on the two most probable origins of the disorder: genetics and hormones. About the irreversible fait accompli of the former, nothing can be done, but contributing hormonal conditions can be controlled by medication that minimizes hormonal fluctuations during periods such as adolescence, pregnancy and menopause. Psychological factors, such as stress, anxiety, pressure or friction. The latter includes pressure of an emotional and physical nature, such as helmets, tight, abrasive clothing or chin straps. Dietary issues, such as a high carbohydrate or dairy product intake. Infections that are not diagnosed or treated. The lack of sufficient hygiene. Drugs – this category includes ingredients in prescribed medications, such as antidepressants, anti-epileptics, androgens (male hormones) and steroids, as well as smoking and alcohol. Cosmetics – these can be pore-clogging (comedogenic) and aggravate acne, and water-based products are, therefore, considered safer. Occupations that result in exposure to industrial products or any adverse environmental conditions. Inappropriate skincare with soap-based cleansers or products that disrupt the skin’s natural balance. Depending on the severity of the condition, a dermatologist might consider it appropriate to prescribe antibiotics, birth control pills, or isotretinoin, in order to treat the condition from within. Isotretinoin is generally regarded as the most successful for a wide range of acne cases and improvement is often long-lasting. Comedo extraction: an incision is made with a large needle or blade to extract blackheads and whiteheads. 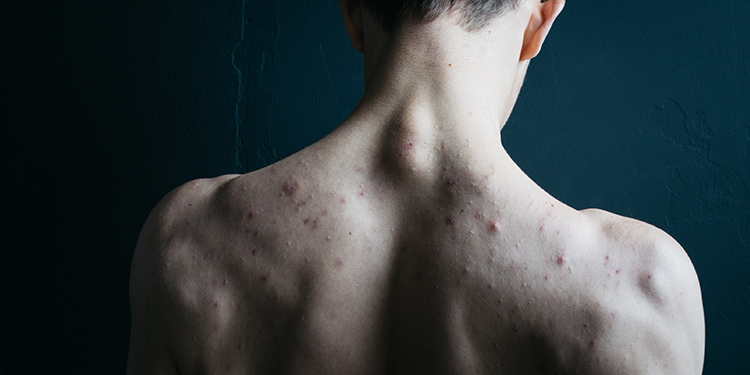 An inflamed acne comedo can also be injected with a corticosteroid for immediate relief. Microneedling: an instrument with multiple rows of tiny needles is rolled over the skin to stimulate a wound healing response and collagen production. Subcision: a tri-bevelled hypodermic needle is inserted through a puncture in the surface of the skin and manoeuvred to make cuts that loosen the scar from the underlying subcutaneous tissue. This releasing action lifts the depression. Connective tissue that forms during the course of healing also aids in lessening the depressed appearance of the scar. Light therapy treatment: this delivers specific wavelengths of light to the affected area. When regular light is used and a sensitizing substance is applied to the skin, the treatment is known as photodynamic therapy (PDT). Another treatment includes the use of LED Blue Light. These are the most widely supported of all light therapies. Chemical peels: these vary from mild to medium or deep strength. The mild peel (using glycolic acid, lactic acid, salicylic acid, Jessner’s solution, or a low concentration of trichloroacetic acid) works superficially to affect the epidermal layer of the skin, while those with higher concentrations of trichloroacetic acid work on the deeper papillary dermis. Laser resurfacing: this involves the use of lasers to remove (vaporize) the top, damaged layer of the skin. The procedure can be as quick as a matter of minutes or last up to an hour, depending on the severity of the acne. Local anaesthesia is used and it takes between 3 and 10 days for the skin to heal properly. Dermabrasion: a rotating wire brush or spinning diamond instrument is used to wear down the scarred surface of the skin and promote its replacement by a smoother layer. The skin heals between 10 days and 3 weeks. Topical therapies: these include Benzoyl peroxide, topical retinoids like Adapalene, topical antibiotics and combinations of the above. To ensure that one does not aggravate the condition or fall prey to the many myths doing the rounds, it is advisable to place the problem in professional hands. Consult your dermatologist about how to keep unpleasant flare-ups under control, prevent permanent scarring, and improve the appearance of scarred areas that have already formed.